Gardening in Spain Apple Tree Pruning, Apple trees are great because they are so versatile. They offer several varieties, shapes and sizes allowing us to use them in just about any garden situation, even if we only have a small patio area. Gardening in Spain Apple Tree Pruning, Apple trees are great because they are so versatile. They offer several varieties, shapes and sizes allowing us to use them in just about any garden situation, even if we only have a small patio area. Apple trees are great because they are so versatile. Apples flower and produce fruit on long-lived, stubby twigs called “spurs” often called “old wood,” which means we’ll want to prune last year’s new growth back a bit. So without further ado, let’s take a look at some of the more popular ways to prune an apple tree so you can get started working on your own trees. There are normally two goals when pruning an apple tree:Initially on young trees to encourage a strong, solid framework. On mature trees to maintain shape and encourage fruit production. The best time to prune apple trees is in late winter or early spring before any new growth starts. The day apple trees are planted is the day to begin to train and prune them for future fruit production. 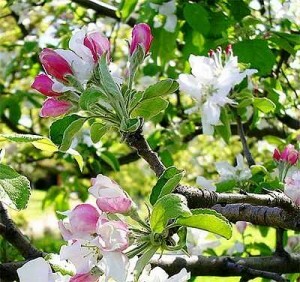 Too often people plant apple trees and leave them untended for several years. This neglect results in poor growth, delayed and under-sized fruiting. A new apple tree will usually be either a 3 to 4 foot (90-120cm) whip (it has no branches), or a 4 to 6 foot (1.2-1.8m) tall young tree with several branches. This is assuming you have not purchased a dwarf variety. 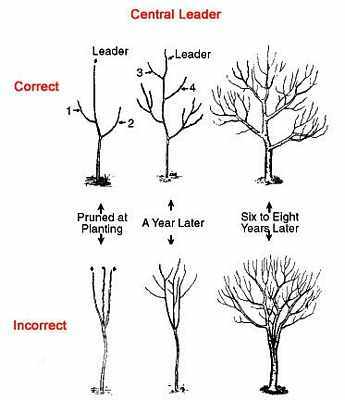 The following pruning styles are if you have recently purchased, or own a young tree, and need to determine its shape as a mature tree. One pruning style is not better than another. Training to a central leader produces a tree that has a pyramid shape.If your newly planted tree is a whip (it has no branches and looks like a long stick) cut the trunk at a height of about 32 inches (80cm). This will stimulate branches to grow along the trunk, and the topmost bud will become the central leader. For a new tree that already has side branches, cut back the trunk to 32 inches (80cm). Cut off any branches along the trunk between the ground and 24 inches (60cm) high. Cut back any remaining side branches to 2 to 4 inches (5-10cm), leaving no more than 2 buds on each branch stub. First Summer: Make sure the top shoot becomes the leader. Pinch back all other shoots.First Winter: If there has been a lot of new growth, choose 3 to 5 branches for the first set of scaffold branches. These branches should spiral around the trunk with about 4 inches (10cm) vertical distance between each branch. 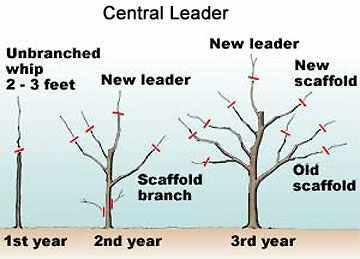 Cut off the other side branches and any vertical branches that may compete with the leader. Prune back the main leader shoot, but keep it as the highest part of the tree to maintain your pyramid shape.Second Summer: Make sure that the top shoot is growing vertically, cut off any competing shoots.Second Winter: Select another set of scaffold branches 2 to 3 feet (60-90cm) higher than the first set. If the tree did not grow enough the second year, do this the third winter.Thereafter: Keep doing the above until you have 3 or 4 sets of scaffold branches. Then simply keep that shape by pruning out watersprouts and any crossing, diseased, or unwanted branches. Try to keep the lower branches longer than the upper ones to maintain the shape. 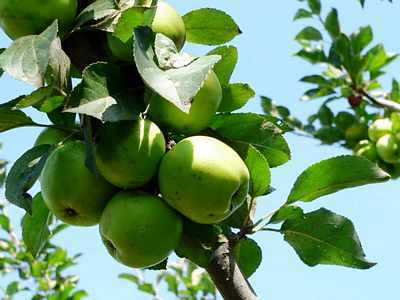 Apples trained with an open center form a vase-shaped tree with no central leader; instead, several major branches angle outward and upward from the top of the trunk.Cut back the newly planted tree to 24 to 32 inches (60-80cm), depending on how low you want the major branches to form. 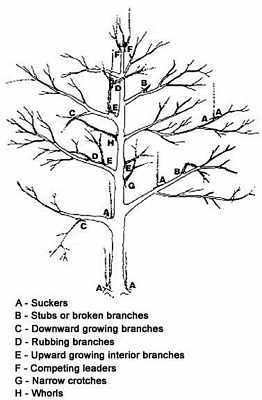 Choose strong, well-spaced branches that are 6 to 10 inches (15-25cm) below the cut to become primary scaffold branches.If the young tree has some side branches, cut back the leader to 24 to 32 inches (60-80cm). Select well-placed side branches that point out from the trunk in different directions 6 to 10 inches (15-25cm) below the cut to become scaffold branches.Cut back the selected branches to 2 to 4 inch (5-10cm) stubs, and cut off all the other side branches. By the end of the first growing season, the major scaffold branches should be formed. 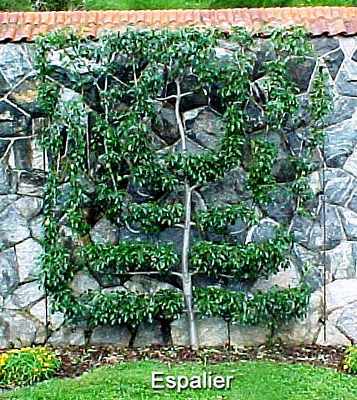 You can grow apples as espaliers as ornamentals against walls or fences, along wires, or on lattices. Semi-dwarf varieties are the best choices because they grow slower and require less pruning than full-size varieties.Simply train the branches into the shape you want, or along a fence or wall. Every year, prune to shape. Direct its growth by pruning frequently during the growing season and during the dormant season to guide it into the shape you want. It may take several years of training before the tree conforms to the shape you want it to take. Mature trees usually already have their shape determined, so it really comes down to maintaining their shape and size. Thin out enough new growth to allow light to filter into the canopy when the tree has leafed out so the fruit can ripen and colour properly. Shorten any branches that are too long to avoid leggy growth. Shape tree evenly and remember apples flower and fruit on old wood, so head back new growth to direct energy back into the flowers and fruit. The first step is to remove all the upright, vigorous growing shoots at their base that are shading the interior. 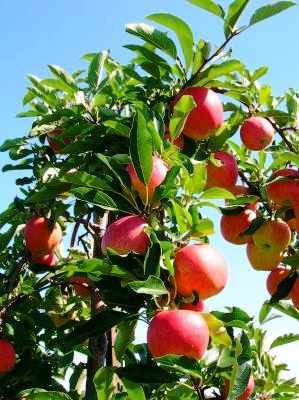 As with the young apple trees, it is necessary to select 3 to 5 lower scaffold branches with good crotch angles and spaced around the tree. Limbs with poor angles, and excess scaffold limbs, should be removed at their base. In some cases it is advisable to spread the corrective pruning over two to three seasons. When severe pruning is done in the winter, the trees should not be fertilized that spring. Apple trees are great because they are so versatile. They offer several varieties, shapes and sizes allowing us to use them in just about any garden situation, even if we only have a small patio area. Apple Tree Pruning. 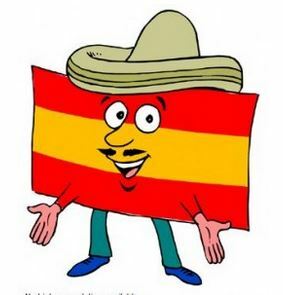 Spain info also covers Bowls Clubs Golf Go Karting fishing Caves and other sports here in the Mediterranean. Apple Tree Pruning.